Running you own business is rewarding, challenging, hard work, and time consuming. Making sure you’ve got enough time to dedicate to running your own business is important to it’s success. It’s worth reviewing how much time you’ve got to spend every so often. It doesn’t matter if you’re just starting your business, thinking about starting a business, or have been running your own business for years. Life happens. Children grow up, and their needs become different. Parents get older, and we may find that we’re needed to do different things within our families. Expectations change. The beauty of running your own business is that you can be flexible. You’re in charge! And how you divide your time is up to you. How much time you need depends on so many factors, that there’s no “one size fits all” answer to this. What can someone else do & how much will that cost you? For example, can you pass work to an administrator or Virtual Assistant (VA), leaving you to carry out the tasks that only you can do? Can you pass work to a contractor to carry out, whilst you simply manage their work each month? For example, using a Public Relations specialist to work with the media can be a really efficient use of your money and time. Leaving them to use their expertise whilst you carry out your favourite work. We worked with a client recently who had 10 hours a week for her business. She had a salaried job, and looked after her family as well. When we looked at what she needed to do, it was do-able for her. She assigned 8 hours a week to creating new products, (she makes things by hand), and will spend 2 hours across the week doing her marketing. This was sustainable for her for the next few months whilst she created more products and added them to her website. She’d then shift the hours slightly to do a bit more marketing and website work. Full time, part time or time to time? There’s many ways to run your own business. There are so many opportunities to create a part-time income, or even a time to time income. You don’t have to think of running your own business as a full time occupation, although for many business owners, this is their aim. If you’re wanting to test the waters, then it’s likely you’ll start when time allows. As your client base grows, you may find you need to commit to regular part-time hours each week or month. This doesn’t have to be the same days and times each week or month, depending what you do. Telling yourself, (and your diary), that you’re working on your business, will ensure you dedicate the right amount of time to growing your business. Sometimes circumstances overtake us. Tracey-Jane’s second business only started to grow rapidly when she was made redundant from her employment. This gave the impetus, and time to grow the business, and it took off. Everything was in place to grow it, and it worked out. We often have to think about income v time in our considerations of the time we need for running our own business. For many business owners, or those considering starting a business, it’s the income that prevents more time being spent in the business for family security. It’s often hard to work out if you have enough time available to successfully run your own business to earn the level of income you desire. Be honest when you’re working through your figures, and pretend it’s going to be hard to make the sales to start with. How much time do YOU need for running YOUR business? Think it through. Work it out. Write it down. Is this exercise about TIME or MONEY? Or are they tied together for you? What works for you may be quite different to your friend, or that person who’s doing something very similar to you. We’re all different & our family situations will vary. Ensure you know what your minimum number of hours are that you can commit to running your business and if it gets that you can’t do that, then maybe it’s time to hang up your business owner badge? We know business owners who do a couple of hours a month, (these are running Multi-level marketing businesses), to those who are working 60 hour weeks when they’re at full capacity in busy periods of the year. 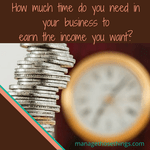 Need help working out how much time YOU need for running YOUR own business? Grab our 5 Day Kick Start Planner and really focus these next few days on the amount of time YOU need. Or join the Business Cheerleading Club & talk it through with other business owners there. Thanks. Yes, I think our time does go in ups and downs, and not just with our work, but with family circumstances too. We have to be clear what time we have available before committing to “doing a business”, and if whatever time we have is sustainable and will make a difference to said business. A timely reminder, thank you for sharing T-J. In my experience, people grossly underestimate the amount of time it will take to do something, and this causes all kinds of problems. Yes, I agree. We often forget the review part of the business cycle & I find that time is the one thing that gets most people ‘stuck’. We may well be in a habit about doing something, but is it helping our business grow, or serving our customers, or is it something we simply like to do? Great article. I am doing review of my time myself. Great insights! Tracey-Jane this post is such a timely reminder for me to focus on managing my time and my resources much more. Thanks! !